AWS (The American Welding Society) is the worldwide leader in certification programs for the welding industry. Since the CWI (Certified Welding Inspectors) program inception in 1976, AWS has certified more than 100,000 welding inspectors alone, plus thousands more working professionals across other certification categories. AWS conducts exams in locations around the world, including 550 U.S. sites and 40 countries each year. Many candidates mistakenly assume their field experience is enough to obtain certification, only to end up frustrated when they fail to pass their exam. Certification exams are intentionally comprehensive to ensure the welding industry the high-quality personnel needed to handle these complex roles. How much preparation? It depends upon your current skills and knowledge. Are the rewards worth it? The rewards are often worth the time you invest: certification can boost your earnings significantly and expand your career opportunities. While there are a few books that can be purchased from the AWS and outside sources on the CWI exam, there are no publications dedicated to helping CWI candidates pass the exam. This title was written for that express purpose. This work is a comprehensive collection of preparatory exam questions and answers for welders, inspectors, students, or anyone interested in the welding metallurgical field. It boasts appendices that include tables, formulas, lists of organizations and major corporations employing welders and inspectors. David R. Quinonez is a Nondestructive Testing and Visual Inspection Advocate. He has met all the educational hours and on the job training hours for qualification and certification as a level II in the five major NDT Disciplines: Magnetic Particle (MT), Penetrant (PT), Eddy Current (ET), Radiographic (RT), and Ultrasonic (UT) Testing. He was previously certified by the American Society of Nondestructive Testing (ASNT) for Level III MT, PT, and by the American Welding Society (AWS) as a Certified Welding Inspector (CWI). Ch 14: Qualification & Certification. Appendix A: Directory – Associations & Organizations; Directory – Businesses & Corporations; Directory – Labor Unions; Specification Material Resources. Appendix B: Acronyms/Abbreviations; AWS Letter Designations for Welding & Allied Processes; Elements, Symbols, & Melting Temperatures. Appendix C: Tables/Formulas; Conversion Factors. 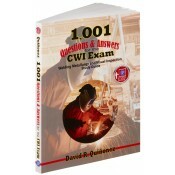 Notify me of updates to 1,001 Questions & Answers for the CWI Exam SALE!